Russia has apologised over the doping scandal uncovered by the McLaren report for the first time, but will remain suspended from international athletics. Athletics' governing body the IAAF banned Russia in November 2015 over evidence of state-sponsored doping. Russia athletics boss Dmitry Shylakhtin said the ban was "correct" and said sorry to athletes beaten by dopers. Rune Andersen, chairman of the IAAF taskforce looking into Russian doping, welcomed the "important" development. But at a vote on whether to readmit the Russian Athletics Federation (Rusaf), 166 members voted to support the country's ban, with 21 voting to repeal it. Russia would only have been reinstated had a two-thirds majority voted in its favour. "I would like to apologise to all athletes who have had gold and silver medals snatched from them at competitions," Shylakhtin told an IAAF conference in London on Thursday. "I can assure you that our new team will fight doping and what happened will never happen again." Nineteen Russians will be competing as neutral athletes at the World Championships in London, which begin on Friday. 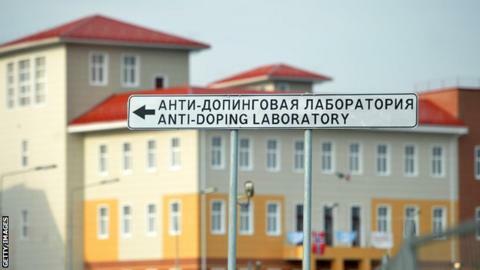 The country could be reinstated in November, by which time it is expected to have met reforms set out by the World Anti-Doping Agency (Wada). Andersen said a November return was "in Russia's hands", adding: "They could complete the steps without much further delay." Russia's sport leaders have previously promised to improve the country's record on doping, but the pace of progress has also been criticised. The McLaren report, commissioned by Wada, detailed evidence of an "institutionalised and disciplined medal-winning conspiracy" that operated in Russia between 2011 and 2015. More than 1,000 Russian athletes - including Olympic medallists - were said to have benefited. As a consequence, Wada recommended banning all Russian athletes from competing at the Olympics in Brazil last summer, but the International Olympic Committee ruled that individual sporting federations should decide. The IAAF was the only governing body to enforce a blanket ban on Russian athletes. Whilst this is an important breakthrough, it will take more than an apology before Russia can be welcomed back to international athletics. Andersen's taskforce called for the ban to remain because he's not convinced a culture of doping has disappeared. The sticking points include no meaningful testing and coaches who should be suspended still being allowed to work. However for the first time cracks have begun to appear in the hard line approach adopted by the IAAF, and don't be surprised if those widen over the next few months. A total of 21 countries backed Russia - with perhaps Jamaica the most surprising of those - and the signs are their return is no longer a remote possibility. Meanwhile, two female Ukrainian athletes - Olesya Povh and Olha Zemlyak - have been provisionally suspended before the World Championships. The pair have been charged with an anti-doping rule violation for the use of "a prohibited substance", the IAAF's Athletics Integrity Unit said. Povh was set to compete in the 100m and 4x100m relay, while Zemlyak had been entered for the the 400m and 4x400m relay. Read more on Usain Bolt: Can the legend sign off with London 2017 World Championships win?